Apple pie is one of my favorite desserts. Although it often leaves me feeling guilty after eating because I know it’s not that healthy. This smoothie solves that problem. 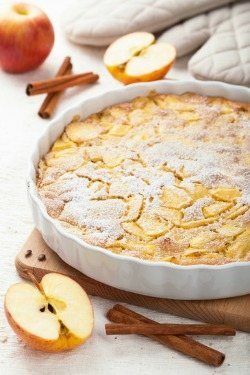 Think of drinking a delicious slice (or two) of apple pie that’s loaded with good nutrition leaving you feeling good about yourself after consuming. That’s the beauty of many smoothie recipes, you can transform an otherwise unhealthy food into something that’s highly nutritious and tastes just as good, if not better. There’s obviously apple in this recipe, and we all know an apple a day keeps the doctor away; so I’m going to focus on the health benefits of each of the three spices this recipe calls for. Hmm, it seems I need to incorporate these spices into more of my smoothies, and diet! If you dig this recipe, you’re bound to like the Apple Cobbler Smoothie as well. Enjoy! I’d love to hear what you think of this delicious Apple Pie smoothie in the comments below. Happy Blending! These are wonderfully creative recipes! I’m wondering how the smoothies fit into your diet. Do they replace a meal or are they a snack in between the “three meals a day” routine? Some can be high in calories and some low, so how would one balance that. Thanks for the kind words regarding my smoothie recipes – I like to keep it fun and interesting (and healthy) by trying a variety of combinations and ingredients. Great question. Personally, I drink a pretty large smoothie every morning for breakfast, and often after working out. Occasionally I’ll replace lunch or dinner with a smoothie or make one for dessert or as a snack. How you integrate smoothies into your diet should be based on your particular needs and goals. You might replace a meal with a higher calorie, more filling smoothie, or whip up a smaller one as a snack. Every smoothie recipe on my site or from anywhere else can be adjusted (ingredients and amounts of each) to your current needs. That being said, find your own unique “smoothie groove” and always be open to experimenting and changing things up. Hope that adequately answers your question. Feel free to ask more. If I want to make 2 -8 ounce smoothies at same time do I just double all ingredients? Confession: I haven’t actually been trying any of these recipes as I make them. There was a little left over of this one today though (about a third of a cup) (I am sipping it as I type) (from a measuring cup, might I add) (that’s how I know it’s a third of cup) (in case you’re wondering that is), and I had to comment and wax poetic about its unique flavor. Hard to believe that something that tastes so awesome is actually good for you as well. It’s like dessert for breakfast, which is how all meals should be IMO. Anyway, thank you for all these wicked recipes. Would this work with kefir instead of almond milk? Looks delicious! Absolutely, Evan. Guessing it would be even tastier with kefir. Hi,I would like to make the apple pie smoothie but it is high in carbs and sugar.would it be OK for diabetics to drink this smoothie,have a healthy meal and then make this smoothie?I have had a slice of my aunt’s pie made with splenda and it didn’t raise my blood sugar very much. Having this smoothie for dessert after a healthy meal is a good idea. Maybe split it with someone. Hi,I will split this apple pie smoothie with my mom when I make it in my blender.we have a lot of your smoothies to make in my blender,and I will let you know how much we enjoy drinking this smoothie. Look forward to hearing how you and your mom liked this smoothie, Kim.